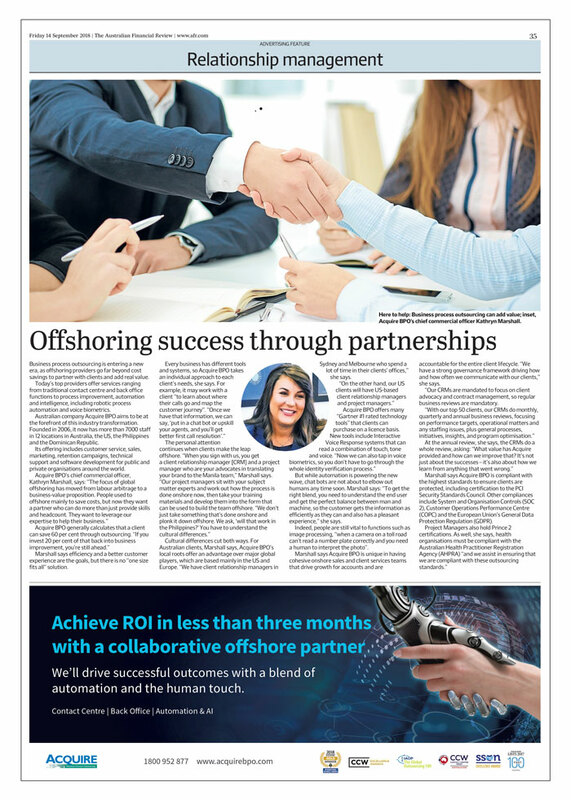 In the September 14 issue of the Australian Financial Review, Acquire BPO Chief Commercial Officer (CCO) Kathryn Marshall talks about the value of a solid, strategic partnership to achieve success in offshoring. “The focus of global offshoring has moved from labour arbitrage to a business-value proposition. People used to offshore mainly to save costs, but now they want a partner who can do more than just provide skills and headcount. They want to leverage our expertise to help their business” says Marshall. Want to learn more about how Acquire’s offshoring partnership approach? Click here.